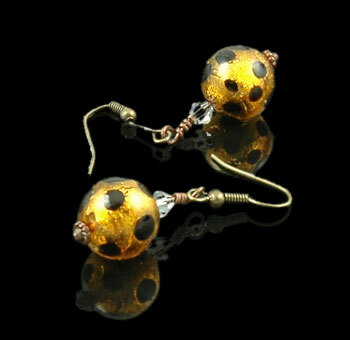 A Beautiful Venetian Glass Leopard print bead dangles from an antiqued gold brass ear wire. These unusual beads are imported from Italy and have a rich warm topaz color with a contrast of gold foil and dark spots beneath the transparent glass. Resting on top is a tiny little Swarovski crystal to bring out their sparkle. Really wonderful color and texture on these.